If you want to make batch changes to your product profiles use Set Product Info to find sets of your products and apply an action. With Set Product Info you set non-price-related data for products such as quantity, GL accounts, class, family and reorder points. You want to set all of your inventory to be available on your Web Store. 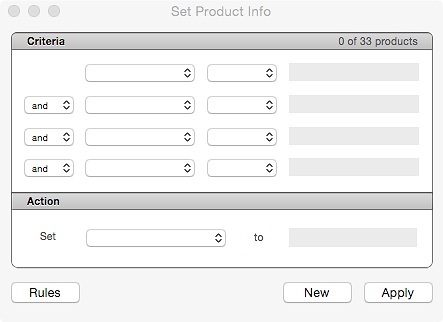 In Set Product Info Product ID begins with P.
In Action Web is checked. Click Apply and all of the items in your inventory are made available on your Web Store. In OnSite StoreMaster on the Tools menu click Set Product Info. In the Criteria area use the filters to select the subsets of your products that you want to change. In the Action area set the parameters to apply to the set. If you want to apply the filters immediately, click Apply, or if you want to save the action to perform on products you modify or future products, click Rules, name the rule and save the current criteria. When you click Save, the rule appears with a checkbox. Select this checkbox to have the rule applied to any product that meets the criteria when you click Save. 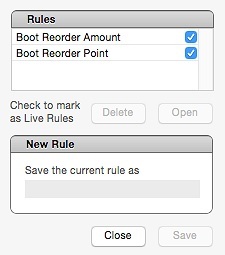 If you don't select the checkbox to have the rule applied, you can apply it manually later.